In my mind, in my head: VOR - What is it ? The television emitters on the band 50-70MHz are being switched off so we need other emitters always on, with known positions suitable for meteor scattering. The 88-108band is too crowded, so, on the adiacent band we can find the navaids for the aeronautical world: VOR, DVOR and ILS. Before thinking about using the navaids for meteor scattering, let's see how they work. VOR is an abbreviation for “VHF Omnidirectional Radio Range”, which implies that it operates in the VHF band. Short range infers that ranges up to 200 NM can be expected. It is still the most commonly used short-range aid. As opposed to the NDB, which transmits a non-directional signal, the signal transmitted by the VOR contains directional information. signals. In theory, the VOR produces a number of tracks all originating at the transmitter. These tracks are called «radials» and are numbered from 1 to 360, expressed in degrees, or°. 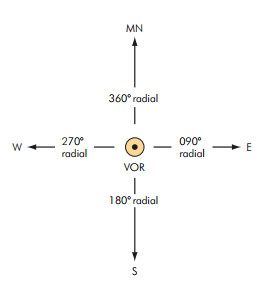 The 360° radial is the track leaving the VOR station towards the Magnetic North, and if you continue with the cardinal points, radial 090° points to the East, the 180° radial to the South and the 270° radial to the West, all in relation to the magnetic North. Before we look in detail at how the system works, I can make it easier to understand with an example. in relation to the lighthouse. To facilitate en-route navigation along selected radials and to provide references for holding and let-down procedures. VOR is a relatively short range radio navigational aid operating between 108 and 118MHz in the VHF band. It is a pilot interpreted aid comprising an airborne Navigation Receiver capable of being tuned to 100 or more frequencies and aConverter/Indicator which accepts signals from the navigation receiver translating them into simple indications on an instrument face. The airborne equipment is used in conjunction with a system of VOR beacons, most of them situated within the airways network. To understand the principles of VOR it is necessary to have a superficial knowledge of the radio wave itself. 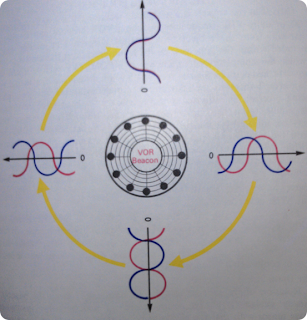 In the section on electro-magnetic energy the basic wave cycle was described (page 50). In essence the state of the electric current within a cycle (i.e. positive or negative strength) is constantly varying with time. Indeed at any particular time the development of the wave may be identified e.g. half maximum positive rising: maximum negative: zero raising to positive etc. As already explained such a state of development is known as a Phase. Imagine a radio beacon designed to radiate two beams, one running north and the other running south. And suppose each beam consists of two waves, the north beam emitting its phases in unison and the south beam with its waves at opposite phases (Fig. 41). An electronic device capable of measuring the difference in phase between two radio waves would, in this case be able to tell the operator when he was within the north beam or south beam. In other words the equipment is able to compare the differences between the phases of two simultaneously transmitted waves and since it uses this principle VOR is known as a Phase Comparison aid. 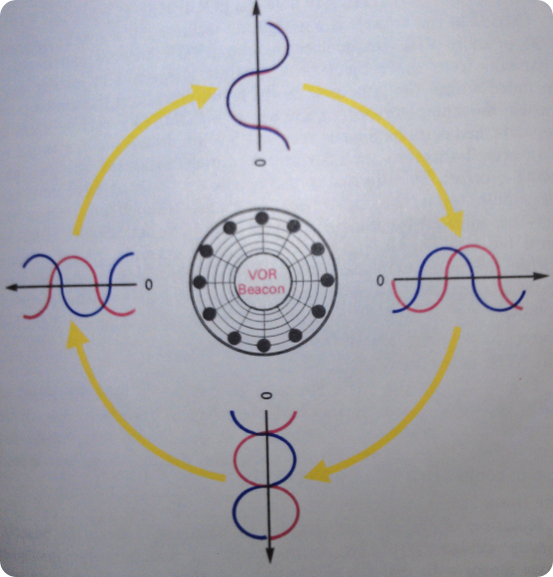 Using the principle of phase comparison the VOR radiates a Reference Signal (REF) in all directions, its phase remaining constant throughout the reception area. A second signal, transmitted as a narrow beam, is arranged to sweep like a lighthouse through 360° (VAR Variable Signal). As it sweeps, the phase of the beacon is constantly altering so that its phase comparison with the fixed reference signal will change according to its position relative to the beacon (Fig. 42). In effect a VOR beacon emits an infinite number of beams or Radials through 360°, each possessed of unique differences in phase between the two signals. It therefore follows that with the air of equipment designed to measure or compare the two phases and translate these into headings from the beacons (radials), a pilot would be able to locate his aircraft in relation to the known position of that beacon. The VOR Beacon is adjusted to transmit radials related to Magnetic North. In a next post I'll explain the ground installation and the frequency used.